Gintama°: Aizome Kaori-hen is an OVA of some unadapted manga chapters. 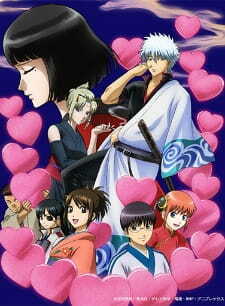 Nothing different from the typical Gintama comedy arcs, with hilarious situations and touching moments towards the end. The story is nothing special, even i would say it's rather confusing, i felt the "main antagonist" just as a plot device to start the situation shown. Her reasons to do what she do are not reliable at all, but in the end the show knows how to fix it. This OVA is hilarious. It certainly lacks the typical referential jokes which Gintama abuses day by day and has a lot of sexual jokes and crazy situations related to that instead. I'll always be amazed by how Gintama manages to go insane in just a second. This OVA is full of it. However, the show is not full of humour: The romance used to build the plot and the character herself are not good per se, if she lived in Yoshiwara all this time they could show her us previously to develop her well; however, the ending of this situation is good enough. The animation is the same as usual Gintama TV adaptation, as well as the sound, using powerful and well known tracks and the OP16, which was the last in Gintama° before things turned serious so it is appropiate for this OVA. Overall i enjoyed this just as much as Gintama TV series, but the plot is not that good (just one comedy arc and not amazing though) and it's just two episodes. But is fun as hell, so, if you like Gintama watch it, recommended. Any Subs yet for the second OVA ?